When waxing poetic about the meaning of home, hyperbole comes easily. After nearly nine years away, Kalamazoo still resonates strongly as home for me. In conversation about Kalamazoo, I often find myself telling people about how we have flown the Warrior there "annually" since we left in 2006. Well...except for 2012. No visit that year. And, actually, neither Kristy nor The Bear have been to Kalamazoo since 2011. Perhaps "annually" is a bit of an exaggeration. Suffice it to say that Kalamazoo and our friends who live there remain on our minds and we actively seek opportunities to return when we can. It happens every year in spirit, even if it does not, in fact, happen in reality. Still, as the summer of 2014 wore on, it was clearly time for our "annual" trip. As if this pull were not powerful enough, one of my closest friends just moved back to Kalamazoo from Rochester. Kent and I were in graduate school together at Indiana University and met when he was a graduate student instructor for my first year electronics course. He finished a year before I did, which is entirely fair, because he started a year before I did. When a recruiter from "The Company" in Kalamazoo came to campus the next year, I learned that Kent had given him my name and, a few months later, I was hired. So I found myself working with Kent again, in a different state and in a very different setting. In Kalamazoo, we learned to fly together. Well, not actually together as in simultaneously, but concurrently. When the Kalamazoo operation was shuttered in 2006, Kent and I (and something on the order of twenty other friends and coworkers) started a new adventure in Rochester, NY together. Kent and I have known each other twenty years and been good friends for the last fifteen of them. In 2014, we found ourselves to be part of a scientific organization that was shrinking with breathtaking rapidity owing to a fundamental change in business model. For no particular reason, I will refer here to this lean, transformed version of our company as "LeanCo" (you guessed it - not its real name). 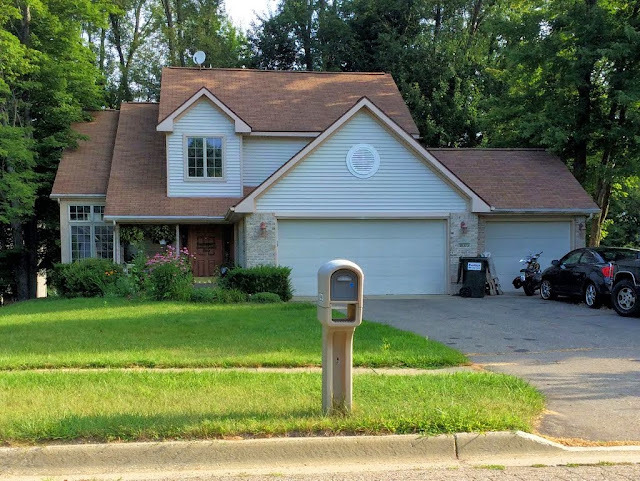 When Kent seized an opportunity to return to Kalamazoo with his family earlier this year, the "annual" journey there became an even greater imperative. But before we could undertake such a visit, Warrior 481 needed some work. My computer, my airplane, lots of things at LeanCo; all broken. I discovered a fried power supply and failing hard drive in my computer when we returned home from vacationing in Scotland this summer. It took nearly a month, entirely too long, but the computer is now rebuilt and restored without any data loss. A new hard drive now serves up my data; I named the boot partition "Lazarus". For as long as I have owned Warrior 481, the directional gyro (DG) has made a dreadful rattling while spinning down after stopping the engine. This thing must be on its last legs, I have thought every year for the past ten. As a recently rated instrument pilot, my interest in gyroscopic instrument reliability is keener than it once was. When the instrument began to precess with unacceptable frequency, it became clear to me that the time had come to overhaul or replace it. I chose the latter. The Aeritalia gyro did not owe anyone a thing; it was built for Cessna in 1980, overhauled in 1999, somehow found its way into the panel of my Piper, and lived there for 15 years. It worked rather well for me over the past decade, despite the clatter. On Wednesday, July 23, I braved the elements to ferry the Warrior to Batavia, NY for installation of the new DG. I was IFR, diverted from my planned routing by a thunderstorm perched directly over the first waypoint, and flew an ILS to accomplish my goal. It was my first instrument approach as the sole occupant of an airplane. Naturally, the DG did not need to be reset at all on its final flight, but last minute good behavior did not save it from becoming a desk ornament. While working under the instrument panel to install the new DG, Brian suddenly unleashed a foul torrent of profanity. That is rarely a good sign. When he emerged from the airplane, he held in his hand a vacuum regulator that is supposed to be one piece, but was now two pieces. It had been shoddily repaired in the distant past and left installed as a potential single point of failure for the entire vacuum system. The owner of the shop took one look at the broken device, saw "lawsuit" written all over it (penned in embrittled adhesive), and made it clear that they would neither repair nor re-install it. No way, no how. Cue the ballad, "The Joys of Aircraft Ownership" (minor key, lots of cello). For something that looks like a $25 part from the local Ace hardware store, replacement regulators are appallingly expensive and the specific unit required for the Warrior II costs more than most. The first price we found was $3,000. I inspected the catalog myself to make sure that the guy reading it did not simply overlook a decimal point (he didn't). Fortunately, a "reasonably" priced unit was available for $400 through another distributor and this was ordered overnight to the shop. To his credit, Jake stayed on the phone with the supplier until he was satisfied that the part was pulled physically from a shelf and placed in a box. I returned on Thursday, July 24 to have the new vacuum regulator installed. Though I could not assess its quality just by looking at it, its appearance inspired more confidence than the broken Cold War era relic that Brian extracted from behind my panel. But now there was another problem. During my preflight inspection that afternoon, I noticed some fuel stains on the bottom of the starboard wing aft of the fuel tank. I hypothesized a slow leak (just stains, no drips) within the wing and that it was probably related to the fuel quantity sending unit that we serviced in April during the annual inspection. Jim agreed, but was too busy to work on it that day. "Bring it in tomorrow. I'll make time for you." He always does. Of course, "tomorrow" was the day that Kristy, The Bear, and I were to embark on our "annual" flight to Kalamazoo to visit Kent and his family. I flew to the Genesee County Airport for maintenance a third day in a row, something of a personal record, I think. This time, I arrived with Kristy and The Bear on board, a baggage compartment packed with weekend luggage, and hopes that the fuel stains under the wing did not portend anything more sinister than a seeping gasket. For anyone who has not counted the number of structural screws that hold a Cherokee wing tank in place, I can tell you from experience that they number around 70 and that each has its own personality. Some are happy go-lucky, some seemed to have an ax to grind with me. Jim and I worked together to remove them all, which required about 20 minutes. The fuel leak fix was simple and we reassembled the airplane, filled the tank, and waited for more seeping. While we waited, I brought The Bear into the shop to show her the PZL-104M Wilga undergoing inspection there. It is a monster truck of a light single, clearly a craft built for rougher terrain than anything my little nose-dragger could handle. With a big engine, flaperons, and leading edge slots, the short field performance of this odd duck of an aircraft must be amazing. After deciding that the new fuel sender gasket showed no evidence of seepage, I filed an IFR flight plan to Kalamazoo while Jim buttoned up the inspection panels. We boarded the Warrior, waved at the little boy watching from his father's shoulders on the other side of the fence, and brought the engine to life. The little boy cleared us to depart with a delighted wave. We received our IFR clearance from Rochester via a ground transmitter and launched into the afternoon sky. We flew against a 15 knot headwind at 6,000 feet. Once level in cruise flight, I reset the new DG, which was off by two or three degrees from when I first set it on the ground before departure. I did not need to reset it again until three hours later, over Battle Creek, when I observed that it was off by three degrees. I think this new instrument is going to spoil me. The direct route from Batavia to Kalamazoo took us further south through southern Ontario than usual and we had our first close look at the Lake Erie end of the Welland Canal. It was another easy IFR flight with no significant precipitation and no actual flight through clouds. En route, Kristy and The Bear played Battleship on Kristy's iPad. "We should play again, Mommy. You can be the Sith and I can be the Republic." After nearly two years of my little aviatrix flat out refusing to watch Star Wars, the child is now a full-fledged Star Wars fanatic. I was impressed with the Detroit controller who made a concerted effort to gather condition reports (tops, bases, and intensity of precipitation) from every aircraft in his sector. From Detroit, we were passed to Lansing where the controller ended each hand-off to a new facility with "it's been a pleasure to serve you tonight." After a smooth, easy flight, we rolled Warrior 481 onto runway 23 exactly at 8:00 pm. When Kalamazoo cleared us for the visual approach to 23, I was surprised. Holding my index finger up to Kristy, I noted that I "can count on THIS finger the number of times I've landed on this runway." I lined up from several miles out using the RNAV-23 approach just because I could. As always, the crew at Duncan Aviation took great care of us. We were directed to parking, our rental car was brought to the plane, and one of the guys assisted me with the cabin cover. The facility had undergone significant renovation since I received the red carpet treatment there the previous fall, including demolition of an old hangar. Though portions of the building were recognizable, the place looked very different than it had in 2000 when Kent and I attended private pilot ground school there. I was so struck by the changes to the facility that I did not notice immediately that Kent and his oldest daughter Ellie (The Bear's pal since they were infants) were waving to us from the FBO window. I did not observe any excessive fuel burn from the right tank en route to suggest the presence of a fuel leak, nor were there any new fuel stains under the wing. On my mental list, the Warrior joined my computer under the category of "Things No Longer Broken". Sadly, these were the only things actually within my power to fix during the Summer of Broken Things. From Duncan, the five of us drove south on Portage Road to my Favorite Pizza Place on Earth: Erbelli's. The Bear was overjoyed to see Ellie again. Consistent with past behavior, Ellie mimicked The Bear's food order. When Kent and I both ordered Original calzones with pints of Oberon, the girls mocked us for being just like them. To set the record straight, we're not at all like them. We're taller, giggle far less (even after the Oberon), and have all of our adult teeth. We checked into the hotel at 10:00, over two hours past The Bear's usual bedtime. She was out almost immediately and we were not far behind her. Saturday morning, we arose, ate a dissatisfying breakfast at the hotel (ice cold powdered eggs were not prominently featured in the hotel's promotional literature), and drove to the Meijer on Shaver Road for some supplies. Because we were nearby, we drove past our first house. 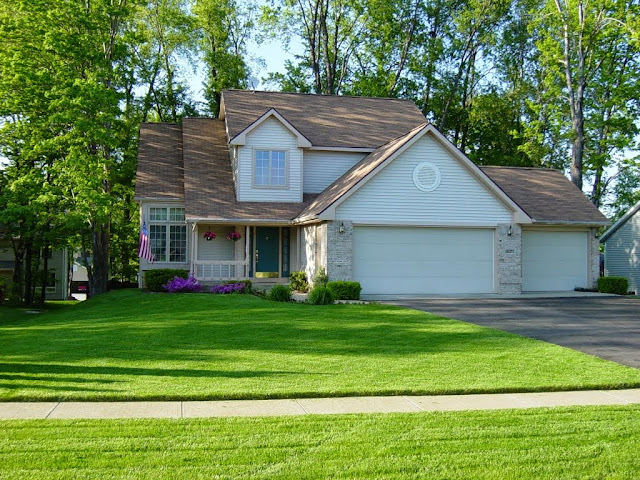 Above is how our house looked in May of 2003, about halfway through our time owning it. We loved this house and leaving it was difficult. I distinctly remember walking out of the front door for the last time with a lump in my throat, locking it behind me. This is how it looks today, some eleven years later. The house itself looked to be in good shape, though the gardener appeared to be on vacation. While signing the paperwork for the rental car at Duncan, I saw a newspaper clipping of this sculpture in Portage located on Westnedge behind the Steak 'n' Shake. It was hewn from the trunk of a massive oak tree that the city cut down. We had to go see it for ourselves. In a word, it was impressive (note that The Bear is included here to provide a sense of scale). Mid-morning, we met with Kristy's former partner in crime and a former student who followed in Kristy's footsteps and now teaches vocal music in one of the local schools. Second breakfast was at the Full City Cafe and proved to be far superior to the first breakfast. The Bear ordered "Mickey Cakes", so named for obvious reasons. I am not generally one to photograph food, but when spreading cinnamon butter on the hot pancakes, I witnessed the chocolate chips melt into such a rich goo that I could not resist. Yes - we actually let our daughter consume this. The Bear was very pleased with her second breakfast. As it turns out, the chocolaty goodness of the Mickey Cakes were too much even for her. The Bear's sweet tooth finally met its match. Later, we accompanied Kent and his family to the Kalamazoo Valley Museum. It is part local history museum and part science center, much like the Rochester Museum and Science Center. Compared to its Rochester counterpart, the Kalamazoo Valley Museum is slightly smaller, has free general admission, and is in much better condition. It also has a genuine Egyptian mummy, which came to the United States as part of an exhibition in 1895 and was sold by the Egyptians to a private collector in order to finance their passage home. The girls watched a video about the mummy with a mixture of horror and fascination. We attended a workshop entitled "Cooking Comets". Here, Ellie is pouring some ammonia into the comet mixture and The Bear is holding her nose (perhaps that career as a chemist is not in the cards for her). The comet was formed by creating a heterogeneous iceball from crushed dry ice containing (formerly) liquid water, dirt (standing in for interstellar dust), ammonia, and Worcestershire sauce intended to simulate liquid methane and other carbonaceous compounds (and, very likely, to give the comet a little savory zip). We took our creation outside and watched it fume and disintegrate in the sun just as real comets do. Within the museum, Ellie, Ellie's sisters, and The Bear played in the robotic zoo, including with this chameleon. Bulls-eye! The Bear got a fly! The fake ice cream seemed to go over well. Not so well, I suspect, as the real thing. After a visit to Bell's Eccentric Cafe to meet some old friends, we cooked burgers at Kent's new house while the kids played. It was good to see Kent and his wife again and I was pleased that he had made a such a great transition from a poor situation at LeanCo to a much better one. Kalamazoo seemed to fit Kent and his family very well. We retired to our hotel for the evening and I began to flight plan for the next day. It will come as no surprise that I value travel by light aircraft. For one, I enjoy the challenge of planning and undertaking every journey. I also appreciate the lack of traffic jams and being able to zip through the sky over the poor, ground bound souls stuck in traffic at the international borders. And when "are we there yet?" finally crept into The Bear's vernacular, reaching Kalamazoo from Rochester in 3.5 hours rather than 8+ is a definite benefit. Besides, heck, I just like to fly. There are times when the forecasts are pristine for days on end, when high pressure pushes into the Great Lakes region and parks there bringing clear sunny skies. On these days, flight planning and weather watching are really easy. This trip, however, was conducted under threat of scattered or isolated thunderstorms for Sunday, the day of our planned return. Though the risk was low enough that I decided to make the trip, I nevertheless spent much of the weekend monitoring weather trends. This constant monitoring and the concerns that underlie it always develop into an accumulated stress borne almost solely by the Pilot in Command. Certainly, being instrument rated widens the window of opportunity to conduct a flight, but it is only an incremental widening because phenomena like severe thunderstorms or icing remain no-go situations unless adequate "outs" exist. We awoke early on Sunday morning to low IFR conditions at Kalamazoo: one-quarter mile visibility and a ceiling of 100 feet. Legal minimum weather conditions for general aviation departures do not actually exist. If I desired, I could legally take off with zero visibility and zero ceiling. Speaking for myself, that would be a really stupid thing for me to do, but if I chose to indulge my inner village idiot, I could do so with the knowledge that it was entirely legal. However, there are most certainly minimum weather conditions that must be met for landing. Conventional wisdom holds that it is unwise to depart any airport under weather conditions that would prohibit a return. I think this is a very sensible rule to live by. Applying it meant that we would need to wait for conditions to improve before departing. Our original plan was to stop in Ann Arbor on the way home to visit our old friend Greg, but I knew that the likelihood of thunderstorm activity would increase later in the day. If we delayed departure too long because of Kalamazoo's conditions, it would make more sense to fly straight home than to stop in Ann Arbor. We had breakfast at the hotel (the eggs were visibly hot this time, but I shunned them anyway), topped off the fuel in the rental car, and returned to Duncan Aviation. At the time of our departure, conditions had lifted to five mile visibility in haze with a broken ceiling of 900 feet. I would have never launched in such conditions when VFR only, but it made for a trivial IFR departure. While I filed my flight plan, Connie presented The Bear with a Duncan Aviation activity book. She told me that Duncan was eager to improve their customer service. Frankly, Duncan-Kalamazoo has given me some of the best customer service over the years that a lowly Cherokee driver could ever ask for and I told her so. For some reason, mine just simply evaporated the moment I fired up the engine on the Duncan Aviation ramp; at Kalamazoo of all places, where I proudly honed my radio technique ten years earlier. A contradiction, then. Surely, I thought to myself, the official FAA document trumps ForeFlight. I followed the A/FD guidance and called Kalamazoo Clearance on 121.2. When the response on frequency was "Kalamazoo Approach", I should have known that something was amiss. But I gave my spiel anyway and was kindly told to call Clearance on 121.75. Regardless of the score, I was the one who looked like he did not know what he was doing. On 121.75, Clearance instructed, "Warrior 21481, cleared to Ann Arbor via Litchfield, CRUXX5, climb and maintain three thousand, expect five thousand one zero minutes after departure, departure frequency 119.2, squawk 1363." The routing was no surprise, I had already received it electronically and expected to fly the CRUXX5 Standard Terminal ARrival (STAR) procedure via the Litchfield VOR (which I last tracked on November 21, 2001 in a Cessna 150 during my first, and only, training flight east of I-69). I had never been issued a STAR before, but this one was relatively simple and I studied it carefully before settling myself into the left seat. Unfortunately, I made life difficult for myself by scrawling the following on my kneeboard: "ARB, LFD CRUXX5, 30 - 50 10 min, 119.2, 136.3." Decimal points do not belong in squawk codes and the fact that I included an extraneous dot while copying my clearance led to a very confused readback. With this error in my script, I read it back incorrectly...twice! My awesome wife had already set the transponder properly and it was only while staring at the number she programmed there that I managed to satisfy the requirement for an accurate readback. Now I REALLY looked like I did not know what I was doing. Radio errors can be very humbling. Once squared away, we departed runway 17 a few minutes behind an airliner and found ourselves blasting through the clouds in short order. We were in zero visibility for a time, then burst forth into a breathtaking valley of cumulus where we were entirely surrounded by gauzy, ephemeral mountains. With the morning sunlight filtering into the ghostly canyon, it was the most beautiful sight of the entire trip. My camera, unfortunately, was in Kristy's purse at the time. Our assigned departure vector diverged from a direct route to the Litchfield VOR. 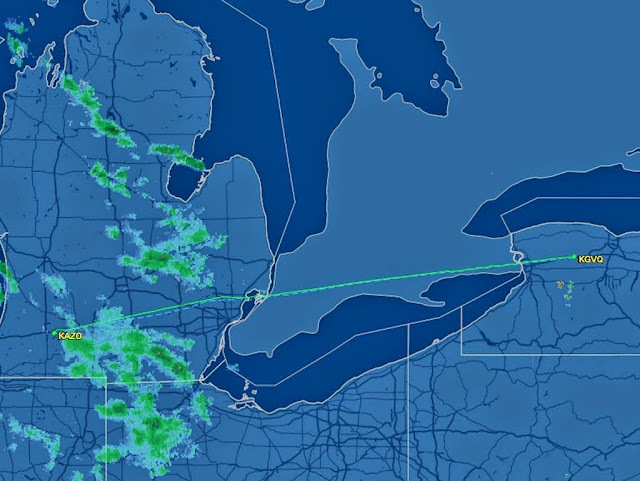 A few miles outside of Kalamazoo, ATC corrected this by clearing us direct to Litchfield. 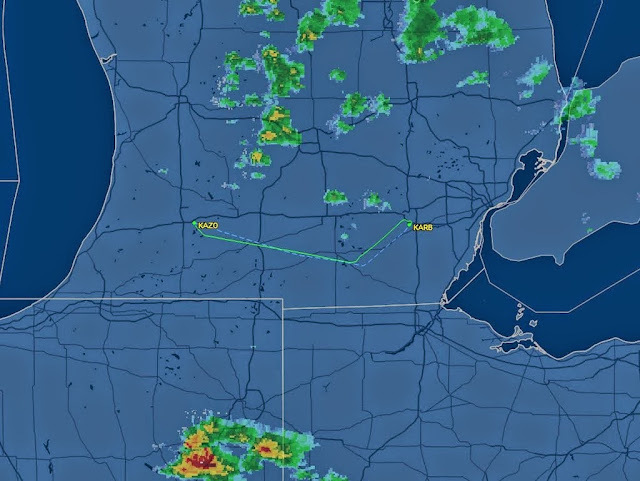 When I advanced the GPS flight plan to Litchfield, the moving map depicted our next leg as a direct flight from Litchfield to Ann Arbor Municipal, apparently skipping the programmed STAR procedure entirely. 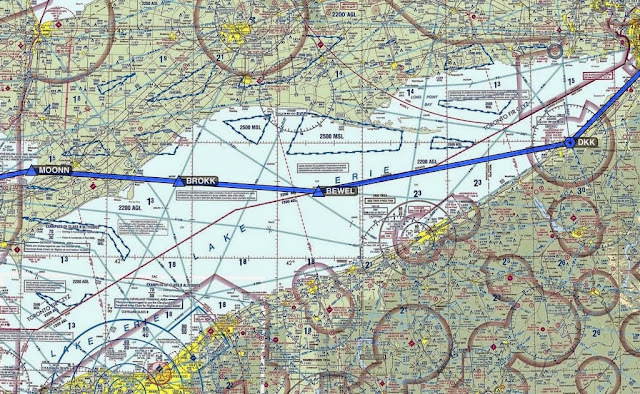 This was obviously incorrect as our next cleared waypoint was CRUXX intersection, which existed along a different heading from Litchfield than the destination airport. No problem, I ignored the GPS and navigated by VOR, which was already tuned and identified as backup. This allowed time for troubleshooting the Garmin 430W. In a few moments, I resolved the problem. It is never enjoyable when the electronics do something you do not expect, but I was gratified that I recognized something was wrong, already had backup navigation set up, and was able to resolve the issue without deviating in any way from my clearance. After the fact, I reproduced the problem using the Garmin 430W simulator. Not surprisingly, the root cause was operator error. I had programmed a flight plan of KAZO to LFD to KARB, then loaded the CRUXX5 arrival with the Litchfield transition. In effect, I entered LFD into the flight plan twice. By going direct to the first Litchfield entry, I effectively circumvented the arrival procedure. The fix, in the air and on the simulator, was to cursor down to LFD shown as part of the arrival and go direct to it. Obviously, if I had not set LFD as part of the flight plan in the first place and allowed the Garmin to set it as part of the arrival, this issue would not have arisen at all; it was a good learning for the day. Ann Arbor reported ten mile visibility with a broken ceiling at 2600 feet. Detroit approach instructed me to expect the RNAV-24 approach. I anticipated this and had already briefed the procedure. I had the approach programmed and ready to go as we came down through the clouds. At 2500 feet, three miles north of the airport, Kristy spotted the field. I verified her sighting, then informed Detroit Approach that we had the field in sight. We received a hasty, "Warrior 481, expect the visual approach runway 24, contact tower 120.3 and have a good day." Frankly, I would have rather flown the instrument approach for the practice. Like the Millennium Falcon dropping out of hyperspace amidst the rubble of Alderaan, I always find it disorienting to be dropped by approach so close to a satellite field with other aircraft buzzing around. This sense was enhanced by the fact that we had just emerged into visual conditions from the cloud base. Including ours, there were three aircraft in the pattern at Ann Arbor. The tower controller's verbal delivery could be best described as a rapid mumble. I have flown into far busier fields than Ann Arbor where the controllers enunciated their words more and rushed less. We could barely understand him. 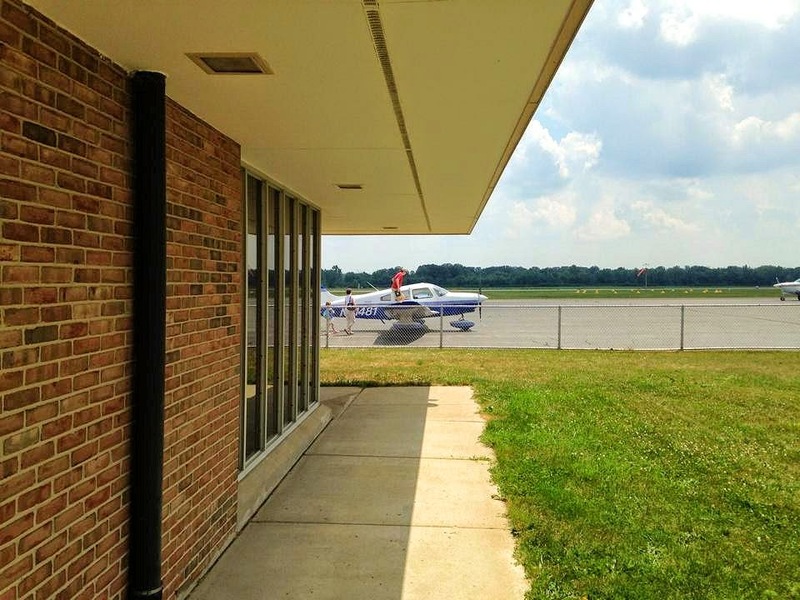 Despite this unnecessary aural challenge, we were soon parked near Solo Aviation at Ann Arbor's main terminal building. With the gyros smoothly spinning down (no more clatter! ), Kristy popped open the door and expressed an "oooo!" of surprise. Greg was standing immediately aft of the wing where the red carpet would go (if provided), beaming at us in welcome the way only Greg can do. Among the many eateries in Ann Arbor, Zingerman's is unquestionably a local institution. Never having lived in Ann Arbor, I would be completely unaware of Zingerman's were it not for the fact that Food Dance in Kalamazoo proudly serves Zingerman's bread, which is just about the best culinary endorsement I can imagine. The original Zingerman's Delicatessen has spawned some additional businesses in A-Squared, including Zingerman's Roadhouse, which is where Greg treated us to lunch. The barbecue was excellent as was the conversation. Topics of conversation focused on the exciting new job in Greg's future and my life at LeanCo. During times when Greg and Kristy talked animatedly about education, I monitored the weather on my phone. The Bear entertained herself amidst all this adult prattle by drinking her lemonade through two straws at once! Convective activity was beginning to pop, particularly south of our planned route in places like Cleveland. Additional thunderstorm cells were forming to the north and west, moving toward us. The forecast at home still looked good, but our departure window was closing. I began to feel the Pilot in Command's cumulative burden of responsibility increase. Departing Ann Arbor, photo by Greg. We were disappointed to have such a short visit with Greg, but weather conditions required decisive action. At Solo Aviation, I filed a flight plan home, intentionally skewing the route of flight north of Detroit and back through Ontario to stay away from the spectacular red blotches showing on the radar over Cleveland. Minutes later, the iPad binged to announce the arrival of an email with the expected routing. What pilot of a low performance single engine piston aircraft wants to fly over all of this water? Am I just oversensitive? Do other pilots flying aircraft like mine actually accept this clearance on a regular basis? To my way of thinking, my airplane does not fly high enough or fast enough for me to be comfortable with this routing. On the bright side, the Rapid Mumbler in the Ann Arbor tower from that morning had finished his shift. Unfortunately, he was replaced by a female controller who also mumbled on frequency. Do they have a pillow wrapped around the microphone up there? I unhappily read back my MOONN FOUR departure clearance and we were soon airborne. Once on with Detroit Departure, I requested a direct route to Sodus to avoid Lake Erie. "Warrior 481, I'll need to speak with Center about that. Stand by." In the meantime, she provided vectors toward MOONN and stepped our altitude progressively higher as the traffic around Detroit Metro allowed. "Warrior 481, you'll be approved for that direct routing, but we need to get you east of Metro first." Outside Kristy's window, the sprawling airport lay below. We watched a behemoth of an airliner trundle down the runway and launch, its size fostering an illusion of impossibly low velocity. Moments later we entered a cloud that was building rapidly. It was as though we had stepped onto an elevator and the Warrior's vertical speed smoothly accelerated to a rate that I have never before witnessed. We gained an additional 300 feet almost instantly. I was reminded of riding ridge lift over Weston Pass near Leadville Colorado. In both cases, the sensation of climb was powerfully effortless. Departing the cloud, the lifting force ebbed smoothly, and I returned Warrior 481 to the assigned altitude of 4,000 feet. Having experienced just a fraction of the power involved in forming a thunderstorm, I was left in awe. The Bear thought it was just about the coolest thing ever, but I viewed it as a valuable lesson. Shortly thereafter, we were cleared to 7,000 feet, direct Sodus. 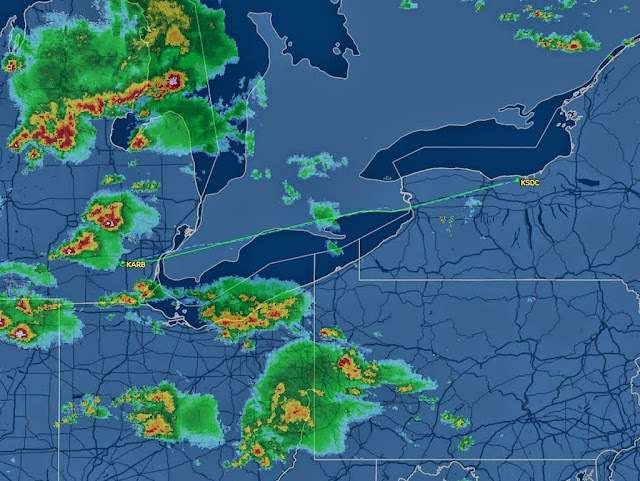 Detroit Approach and Cleveland Center frequencies were busy as pilots requested re-routes around the weather. The Stratus-delivered radar display on my iPad showed the weather to be closing in behind us. The massive cumulonimbus clouds pummeling Cleveland were easily visible from our position on the north side of Lake Erie. We had escaped in a timely manner. The Bear read quietly in the back seat for much of the flight home. We flew through some light rain in Ontario, but did not encounter any instrument conditions or adverse weather. We penetrated the precipitation in Ontario approximately five minutes after ForeFlight/Stratus depicted our airplane entering the rain, suggesting that the time delay between the weather pictured on the iPad and objective reality is relatively short. As usual, we transitioned to Buffalo Approach in the vicinity of the Welland Canal. Crossing the Niagara River, we entered United States airspace with a clear sky ahead. My accumulated stress over the weather ebbed away and we enjoyed a relaxing flight home in familiar airspace. We passed directly over downtown Buffalo, then Rochester, and cancelled IFR in the air about ten miles west of the Williamson-Sodus Airport. The landing was not too bad, either. The homing instinct can be rather strong, especially when close friendships are involved. With an aircraft at your disposal, satisfying that instinct becomes even easier, despite very real obstacles like maintenance and weather. Through attention to detail and careful planning, we can overcome those obstacles safely and effectively. On this trip, everyone in my family visited people and places that they wish they could see more often, all courtesy of a thirty-five year old airplane that I work hard to maintain in as sound a condition as I can. In addition to the satisfaction that comes with completion of a successful journey, I am also very pleased that after 1300-ish hours of flying, I am still learning and still encountering new situations (even if it is sometimes to my chagrin). Maybe I'm just a slow learner, but I view this as the hallmark of a worthwhile endeavor. One thing that I do know for sure: now that Kent and his family are back in Kalamazoo, our "annual" visit is far more likely to start living up to its literal name. For this year's airshow, Mark flew up from New Jersey to meet me. Despite his living in New Jersey, Mark and I have a lot in common. We both grew up in metropolitan Detroit, have similar educational backgrounds (one of Mark's publications is actually cited in my dissertation), and were motivated to start flying by our common mentor, Dave. Mark now owns the Citabria that was my introduction to light aircraft flying. It was great to spend the day with a kindred spirit! The National Warplane Museum's airshow at Geneseo remains a fantastic gathering of rare and antique aircraft with a grassroots feel. Here are some images from this year's event. Starting with the most important airplane first: the very airplane that was my entrance to this entire aviation-obsessed rabbit hole. The Westland Lysander is an interesting-looking odd duck of a liaison airplane known for its short field performance. Though it has capacity for only a single pilot and a single passenger, the airplane is massive compared to US-designed liaison craft (like the L-4 grasshopper). In this photo, the automatic leading edge slats are visibly deployed. For anyone who thinks that the bulky wheel pants Piper implemented in the late 1970s for Cherokees are large, each one of these is about the size of a Prius (dislaimer: all dimensions may be subjectively hyperbolic). These wheel pants also incorporate landing lights. Another view of the Lysander as it taxies to the flight line. In flight, the unusual shape of the wing becomes very evident. One of the show's featured airplanes this year: Kelly Johnson's Fork-Tailed Devil, the Lockheed P-38 Lightning. This is perhaps one of the most unusual aircraft designs on active duty during World War II. These are rare aircraft. I could find record of only eight airworthy examples in the United States, one of which is Glacier Girl, the only other P-38 I have seen in person. This one, Ruff Stuff, is based at the Fagen Fighters WWII Museum in Granite Falls, MN. At first, it seemed that she would not fly that day because of a brake problem. Fortunately, parts arrived while Mark and I were photographing the airplane and the maintenance team from the National Warplane Museum made the repairs in time for Ruff Stuff to make her appearance. I have to wonder what the folks at Lockheed thought when first presented with the plans for this airplane. This Corsair, Skyboss, from the American Air Power Museum has been a regular visitor to Geneseo over the years. Quick Silver, a gorgeous North American P-51D, is built from the parts of 200 other Mustangs. Its owners tout it as "The Resurrected Veteran". Never Miss has never missed a year at Geneseo since her debut appearance in 2010. A TBM Avenger, She's the Boss, owned by Charlie Lynch. Pictured here is the boss, Charlie's wife Elizabeth. Buying the Avenger was her idea. It's literally the "family truckster" and comfortably seats the whole family in the aft bowels of the bulky airplane. Mark and I talked with Elizabeth for a while as she cleaned the gear leg and I was amused to hear her talk about travelling in the Avenger the way Kristy would talk about travelling in the Warrior! The other major guest star at this year's Greatest Show on Turf was the De Havilland Mosquito from Virginia Beach's Fighter Factory. Known as the "wooden wonder", this twin-Rolls Royce Merlin powered light bomber is constructed almost entirely of wood. The lack of rivets on a World War II aircraft is striking. Mark and I got to take a peek in the cockpit. This is the only airworthy Mosquito or "Mossie" in the United States. As far as I can tell, there are only two airworthy examples in the world, with the other one based in Vancouver. Several others are under restoration. As the airshow announcer said, "what sounds better than one Merlin engine going by? Two Merlin engines!" I had wavered in my intent to go to Geneseo this year, but when a photo of this rare airplane sitting on the field appeared on the National Warplane Museum's Facebook page, I knew I had to go. This A-26 Invader was on static display only. This Trichamp, a rare Aeronca-built tricycle gear variant of their timeless Champ design, is very important to me. She and her owner, Ed from Le Roy, were my saviors two years ago when I needed to retrieve Warrior 481 from southeast New York after the carburetor fire incident. It was one of the best airplane rides I ever received. Thanks, Ed! Ed flies his Trichamp at Geneseo every year during the flight of L-birds. He loves every minute of it. Upon seeing this ponderous biplane, the Antonov AN-2 Colt, Mark and I reminisced on how our mentor Dave had a huge soft spot for this beyond-beefy biplane. When I pointed out the massive strut supporting the horizontal stabilizer, Mark noted that it looked like the wing strut on a Cessna. And he was right. And, believe it or not folks, it actually flies! Whiskey Seven, The National Warplane Museum's C-47, back home in New York after a hop across the Atlantic to Normandy in celebration of the 70th anniversary of D-Day. Whiskey Seven is herself a D-Day veteran. Stearmans! I miss the days of flying in the Stearman out of South Haven. Tom Duffy's B-25 bomber, Take-Off Time. This beautiful white WACO biplane was breathtaking. It appeared to be a legacy model rather than a newly-constructed ship from Battle Creek, MI. As usual, Rob Holland was nearly impossible for me to photograph with my lame point and shoot camera as he flung his custom built MXS/RH aerobatic airplane around the sky with violent precision. I have seen Rob perform every year at Geneseo and have always been amazed. He is also a terrific guy to chat with. Mark and I found the MXS-RH parked in Geneseo's main hangar. Both of us cringed as we watched the general public smear their greasy paws all over Rob's gorgeous airplane. Folks, please, look but don't touch. Take-Off Time streaked low over the field and dropped watermellons. I don't know what was in those watermellons, but the preset charges that exploded on the turf runway suggested that they were napalm watermellons. This led the announcer to comment, "that's what happens to me when I eat too much watermellon, too!" Maybe he should have stuck to his script! Unfortunately, the ground crew was a bit lackadaisical about quelling the fires burning on the dry turf. The situation was getting out of hand when the Geneseo fire department interceded and decisively extinguished the blaze. Still, Take-Off Time and Skyboss were hidden by residual smoke upon landing. Mark and I retired to camp chairs under the wing of his Citabria to watch the transport aircraft fly near the end of the day. Paratroopers leapt from Whiskey Seven just as they did over Normandy, France both earlier this year and 70 years ago, plummeting to earth under their round, World War II style canopies. The sound of two Merlins, this time on separate aircraft, roared over Geneseo. The show ended with a terrific formation flight between the P-38 and the Mosquito, but my camera battery died before that occurred. As the show wound down, I said farewell to Mark and started for home. After seven and a half hours in the sun at near 90°F temperatures (my car claimed 88° in Geneseo), I was ready for some air conditioning! It was a great show, as always, and my hat is off to the National Warplane Museum and its volunteers that make The Greatest Show on Turf a reality every year!